Stroble joined Webster colleagues for the Leiden campus celebration of International Women's Day and a meeting on The Bijlmer Project. Webster University President Elizabeth (Beth) J. Stroble met with members of the Leiden campus while in the Netherlands earlier this week. The visit coincided with worldwide recognition of International Women's Day, and she joined the campus celebration of that event as well as the latest meeting on The Bijlmer Project, a nonprofit, grassroots collaborative project that assists survivors of human trafficking. Webster Leiden and the Christian Aid & Resources Foundation (CARF) collaborate on this research and intervention-based project, focusing on the psychosocial needs of victims of human trafficking who were bought and sold for sexual exploitation. In her remarks for the Women's Day event, Stroble emphasized the importance of serving populations who have had their "dreams deferred," referencing the Langston Hughes poem, "Harlem," which made that phrase part of the lexicon. The Webster Groves campus will host a panel discussion on trafficking on March 19, with a focus on its impact in the St. Louis area. 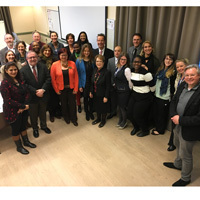 Webster Legal Studies faculty, in partnership with the legal community in St. Louis and Webster colleagues in Leiden and Vienna, have been studying this and functioning as advocates in services to victims and for policy improvements. The upcoming panel builds on their work and The Bijlmer Project. Read more about the The Bijlmer Project in this profile in the first issue of Glimpse.